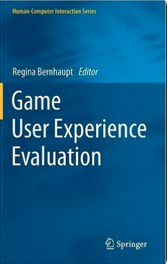 El-Nasr, M.S., Nacke, L.E., Drachen, A., Calvi, L., Isbister, K., Bernhaupt, R., and Desurvire, H. (2012), Extended Abstract: Game User Research at the CHI 2012 conference, Austin, TX, May 2012. Desurvire, H. (2011), Playing to Learn: Teaching User Research to Game Design Students, User Experience, Volume 10, Issue 4. Wiberg, C., Jegers, K., and Desurvire, H. (2009) TELEMED 1009, February 2009, ACHI 14: Applications, Cancun, Mexico. How Applicable is Your Evaluation Methods – Really? Desurvire, Heather, Wiberg, Charlotte. 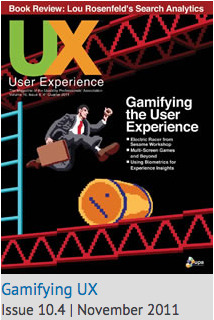 (2009) Game Usability Heuristics (PLAY) For Evaluating and Designing Better Games: The Next Iteration. HCI Conference, 2009, San Diego, California USA. Desurvire, H., Jegers, K., Wiberg, C. (2008) How Applicable is Your Evaluation Methods – Really? Analysis and Re-design of Evaluation Methods for Fun and Entertainment at the IEEE computer society conference, Mexico, 2008. Desurvire, H., Wiberg, C (2008). Master of the Game: Assessing Approachability (GAP) in Future Game Design. In the CHI'08 Extended Abstracts and Conference DVD, International conference on computer human interaction, ACM CHI 2008 conference, April 2008, Florence Italy. Desurvire, Heather, Wiberg, Charlotte. (2007) Evaluating Fun and Entertainment: Developing A Conceptual Framework Design of Evaluation Methods INTERACT conference, Brazil. Desurvire, H., Jegers, K., Wiberg, C. (2007) Developing A Conceptual Framework for Analysis and Design of Evaluation Methods. Presented at the workshop ‘Beyond Current User Research: Designing Methods for New Users, Technologies, and Design Processes’ at the CHI 2007 conference, San Jose CA, USA, April 2007. Desurvire, H., Jegers, K., Wiberg, C. (2007). Evaluating Fun and Entertainment: Developing A Conceptual Framework Design of Evaluation Methods. Accepted at the workshop “Facing Emotions: Responsible experiential design’ at the INTERACT 2007 conference, Rio, Brasil, September 2007. Desurvire, H. (2007). List of Core and Accessibility Principles for Good Game Design (LA CHI Association Meeting Presentation). Desurvire, H., Chen, B. (2006). 48 Differences Between Good and Bad Video Games: Game Playability Principles (PLAY) For Designing Highly Ranked Video Games (white paper). Desurvire, H., Caplan, M., Toth, J. (2004). Using Heuristics to Improve the Playability of Games. CHI conference, 2004, Vienna Austria (In the collection of Abstracts). Desurvire, H. Faster Cheaper!! Are Usability Inspection Methods as Effective as Empirical Testing? in “Usability Inspection Methods”, edited by Nielsen, J., and Mack, R., J. Wiley and Sons, 1994, pp.173-202. Desurvire, H., Schwartz, L. The HCI as a Consultant, report from the CHI ‘96 Workshop. SIGCHI Bulletin, to be published in 1996. Desurvire, H. and Thomas, J.C. Enhancing the Performance of Interface Evaluators Using Non-Empirical Usability Methods. In the Proceedings of the Human Factors Society 37th Annual Meeting, October, l993. Desurvire, H., Kondziela, J., and Atwood, M. (l992a). What is Gained and Lost When Using Evaluation Methods Other Than Empirical Testing (short paper version)? In the proceedings of the ACM conference, CHI’92, collection of abstracts, pp. 125-126. Desurvire, H., Kondziela, J., and Atwood, M. (1992b). What is Gained and Lost When Using Evaluation Methods Other Than Empirical Testing (full paper version)? In the proceedings of HCI 1992, Cambridge University Press, edited by Monk, A., Diaper, D., and Harrison, M.D., University of York, U.K., September 15-18, 1992. Jeffries, R., and Desurvire, H. Usability Testing vs. Heuristic Evaluation: Was there a contest? SIGCHI Bulletin, 24, 4, pp. 39-41, October 1992. Desurvire, H., Lawrence, D., and Atwood, M. Empiricism versus Judgment: Comparing User Interface Evaluation Methods on a New Telephone-Based Interface. SIGCHI Bulletin, 23,4, pp. 58-59, October 1991. Nielsen, Jakob, and Desurvire, Heather. Comparative Design Review: An Exercise in Parallel Design, 1993, SIGCHI Association and INTERACT 93. INTERCHI 93’. H. Desurvire in Usability Inspection Methods, editors Jakob Nielsen. Desurvire, H. Usability Testing Results of the Plan Object Data Base. Internal Bellcore document TM-TAP-014420, June 1989. Stuart R., and Desurvire, H. The Truncation of Prompts in Phone Based Interfaces: Using TOTT in Evaluations. In the Proceedings of the Human Factors Society 35th Annual Meeting, 1991. 2016 ACM CHI Associate Chair Papers - Games, Desurvire, H.
2013-2014 ACM CHI Game Community Co-Chairs, Desurvire, H, and M. El-Nasr. 2012 ACM - CHI Workshop Co-Chairs on Game User Research, Desurvire, H, and M. El-Nasr. 2012 FDG Workship Co-Chairs on Game User Research, Desurvire, H, and M. El-Nasr. Creating Unprecedented New Player Experience! Principles for Enhancing the Player Experience! Desurvire, H., Guest speaker: Why Usability Matters: Optimizing Fun While Boosting Game Designers' Creativity. INplay, 2011, Toronto, Canada. Desurvire, H., Game User Research: Boosting player experience while keeping game designers' happy. Big Design Conference, Guest speaker, Dallas, Texas 201. Desurvire, Heather, Wiberg, Charlotte. (2009 ) Game Usability Heuristics (PLAY) For Evaluating and Designing Better Games: The Next Iteration. HCI Conference, 2009, San Diego, California USA. Desurvire, Heather. PLAY Principles (For Designing and Evaluating Player Experience). HCI Conference, 2009, San Diego, California USA. Approachability in Future Game Design. CHI Conference, 2008, Florence, Italy. Desurvire, H. (2004). How to Apply Usability to Games. A new area, Playability. Presentation at the meeting for Los Angeles chapter of Computer Human Interaction (LACHI), March 2004. Desurvire, H. Panelist in Featured Presentation of ACM CHI Conference. Panel discussion on the playability methods for making games better. Keeker, K., and Lazarro, N. (2004). What’s My Method? A Game Show on Games. Conference on Human Factors in Computing Systems, (CHI 2004) (pp. 1093-1094), Vienna, Austria, April 2004. Review of Panel. Desurvire, H., Caplan, M., Toth, J. (2004). Using Heuristics to Improve the Playability of Games. CHI Conference, 2004, Vienna Austria. Desurvire, H. (2002) ; Usability and the current state of Software and Games. STA Conference in Long Beach. Desurvire, H., Schwartz, L. (1996) Co-Organizer of Workshop, “HCI Professional as a Consultant.” CHI, Computer Human Interaction Conference, Vancouver, Canada, April 1996. Desurvire, H., Thomas, J.C. (1993). Enhancing the Performance of Interface Evaluators Using Non-Empirical Usability Methods. Presented at the local Human Factors Society chapter of New York, MetChapter, December 1993. Desurvire, H., Nielsen, J. Co-chairs of Panel Discussion: Comparative Design Review. Presented at the INTERCHI ‘92, International Conference on Computer-Human Interaction, Amsterdam, Holland, April 1993. Desurvire, H. (May 1992). Comparing Effectiveness of Alternative Techniques to Empirical Testing. Presented at the workshop, “Usability Inspection Methods” (Monterey, California, May 3-7, l992), ACM, Monterey, California. Desurvire, H., Kondziela, J., and Atwood, M. (1992a). What is Gained and Lost When Using Evaluation Methods Other Than Empirical Testing (short paper version) presented at the ACM Conference CHI ‘92, Monterey, California, May 3-7, 1992. Desurvire, H., Kondziela, J., and Atwood, M. (1992b). What is Gained and Lost When Using Evaluation Methods Other Than Empirical Testing (full paper version) presented at the Human-Computer Interaction conference (HCI'92), University of York, U.K., September 15-18, 1992. Desurvire, H., Kondziela, J., and Atwood, M. (1992c). Comparison of Alternatives to the Traditional Usability Testing Method against Laboratory and Field Results. Invited talk at Institut National de Recherhe en Informatique et en Automatique (INRIA), Le Chesnay, France, September 1992. Desurvire, H., Lawrence, D., and Atwood, M. (May 1991). Empiricism versus judgment: Comparing user interface evaluation methods on a new telephone-based interface. CHI ‘91 Conference, New Orleans. Turner, T., Desurvire, H., Lawrence, D., Atwood, M. (May 1991). Poster: Skill Acquisition and Interference in Complex Tasks. Displayed at the ACM CHI ’91 Conference, New Orleans. Desurvire, H., Nielsen, J. Co-chairs of Panel Discussion: Comparative Design Review. Presented at the Bellcore and Bell Operating Companies User-Centered Design Conference 1991, New Jersey. Desurvire, H. (May 1990). Poster: Improving the Usability of a Corporate Database Through Iterative Testing: Work in Progress. Displayed at Bellcore’s User-Centered Design Conference 1990, New Jersey. Desurvire, H., Shinn, M., and Wong, N. (May 1987). Organizational Strategies to Aid Working Parents: A Replication. Presented at the meeting of the American Psychological Association Division 17, South Carolina.